Rosy does dishes. Getting the 2-year-old involved in chores did lead to the kitchen being flooded and dishes being broken. But now she is still eager to help. Rosy does dishes — voluntarily. 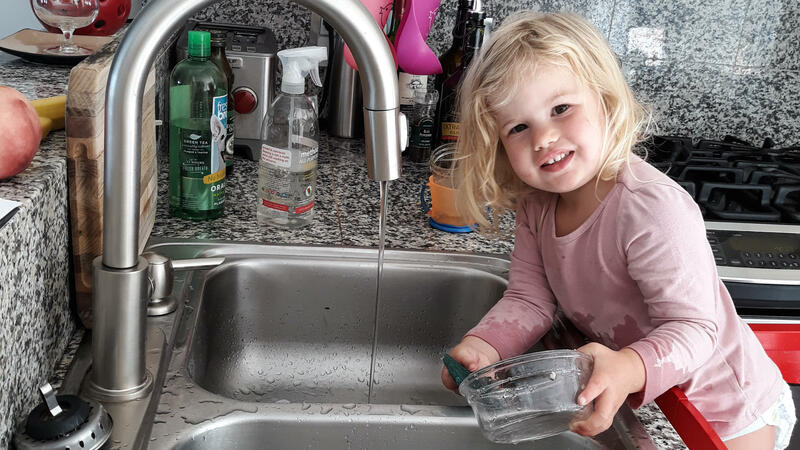 Getting the 2-year-old involved in chores did lead to the kitchen being flooded and dishes being broken. But now she is still eager to help. "She is old enough to understand what needs to be done around the house," Maria de los Angeles Tun Burgos told me through a translator. "Sometime I go a way from the house, and when I come back, I find the house cleaned and everything picked up." At a neighbor's home, I saw the phenomenon again. A 12-year-old daughter started mopping the floor, without being asked. Her younger sister helped her mom feed the chickens, water the plants and happily ran to the corner store to pick up meat for dinner. What in the heck was going on? Was there something in the Yucatan water or did these Maya moms know the secret to raising helpful kids? Turns out the latter is likely true. Researchers have documented that kids in Mexico with ties to indigenous communities tend to be more helpful — and more likely to help voluntarily — than children without indigenous ancestry. And scientists have started to figure out how these supermoms do it. As we reported back in June, the moms harness the power of toddlers — and their zest for being helpful. They encourage kids from ages 1 to 3 to watch and participate in chores, even though the toddlers aren't really competent. Over time, the moms say, children will become more capable while maintaining their eagerness to be helpful. But does this method work in an urban home in the U.S.? 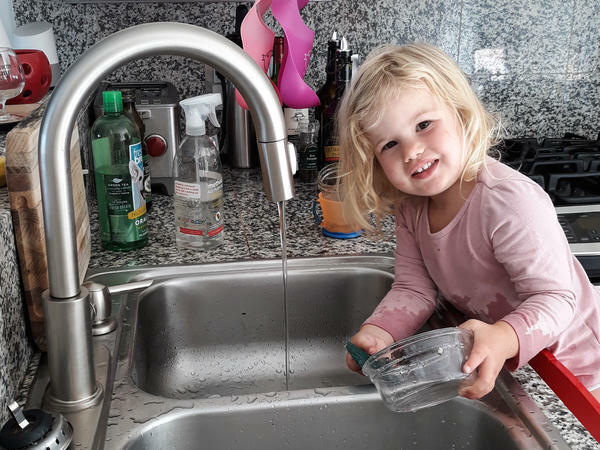 To find out, I tested it out with my 2-year-old daughter, Rosemary, who was showing great interest in all sorts of household chores. From washing the dishes to cooking breakfast, Rosy wanted in. At first, the Maya method was catastrophic in my hands. Rosy and I broke dishes, flooded the kitchen floor while washing dishes and ruined a load of laundry. She also ended up with a tiny burn on her wrist — about the size of a ladybug — when I let her help me fry meatballs one evening. (There's a reason why they don't make hot mitts in toddler sizes — although I am still on the lookout for a pair). But over time, I figured out how to modify the Maya method to work in our tiny San Francisco apartment. And the results have been incredibly gratifying. Such contributions are tiny — and don't really help me. But I can tell she is learning something golden: To love collaborative activities and working together. When we do a chore together, she gets this slight grin on her face that says: "Yeah, I'm kind of a big deal, Mom." So how did I turn a tantrum-fueled toddler into a chore-loving cherub (as if). To be honest, I needed to revamp the way I parent. I changed the way I interact with Rosy and the way I view her position in the family. 1. Make chores the fun activity of the day. Before I learned from the Maya moms, I would try to do all the chores — laundry, dishes, sweeping, cooking — while Rosy napped or was asleep for the night. That way, I would maximize "play time" while she was wake. Now I relax, read and enjoy myself while she's sleeping — and save all the chores to do with Rosy. This makes Rosy feel like a full-fledged, contributing member of the family. And to be honest, it's way more rewarding. I get to teach her how to cook real food in a real kitchen instead of watching her pretend to cook fake food on a fake stove in our living room. Instead of teaching her that "chores are for mom and play is for Rosy," I'm showing her that chores are for the whole family. 2. Welcome the 30-pound troll trying to stop you from finishing the chore. When Rosy wants to help with chores, my knee-jerk reaction is to shoo her away. I want to say something like, "Can you just leave me alone for a few minutes so I can finish these darn dishes!" My goal is to have her participate in the "action" as often as she can, even if that means simply watching me make pancakes for the umptenth time. That's all you need for her to learn that she is part of team. And one of these days, she will be able to make pancakes for me. And here's one of the best parts: You don't even have to explain what you're doing. Kids will learn just by watching. Who knew! 3. Take your time with the chores. Before visiting the Maya families, I would rush through chores. Why linger on folding the laundry? But now, I relish a relaxed pace. If I rush, Rosemary has a hard time participating. Sometimes I finish the chore before she even realizes we started it. So I decided that chores are going to take two to three times longer than if I did them alone. I realize it usually doesn't matter how long it takes. And yes, sometimes we are time restrained and then I have to do most of the chore, but many times, we really don't need to rush. Plus, I've realized that Rosemary responds to requests for help about three-to five times slower than my husband and I do. Having her help takes a huge amount of patience! One time I asked her to run outside and pick me some basil for dinner. First she said, "No." Then she screamed, "No!" Then two minutes later is she rushed out of kitchen to grab the herbs (toddler logic at its best!). 4. Find a toddler-sized chunk of the task she can complete. The Maya moms made me realize that toddlers get excitement — and great pride — from the smallest contributions to housework. For instance, when we take the garbage out, there is always one milk jug or soda can that doesn't fit in the bag — or falls out when I pick up the bag. That's a perfect way for Rosy to help. She can carry the "extra" items and open the door when my hands are full. For the laundry, she loves pouring the soap in the machine and pressing start. And toddlers are great at rinsing dishes before putting them into the dishwasher. For sweeping the floor, I just bought two brooms. Then I put some music on and we "dance" while we sweep together! Sometimes we sing: "Together, together always together," because I've learned that a huge part of the fun is just being together. Finally, I'm letting the perfectionist in me fade away. I thought the dishes must be loaded in the dishwasher properly, the laundry folded neatly and the floor swept to perfection. But really who's keeping track? Maybe in the end, the pride Rosemary takes in folding a T-shirt is way more important than a perfect fold.